Ticket to Ride railway adventure is a board game app that is based on the most popular train game. 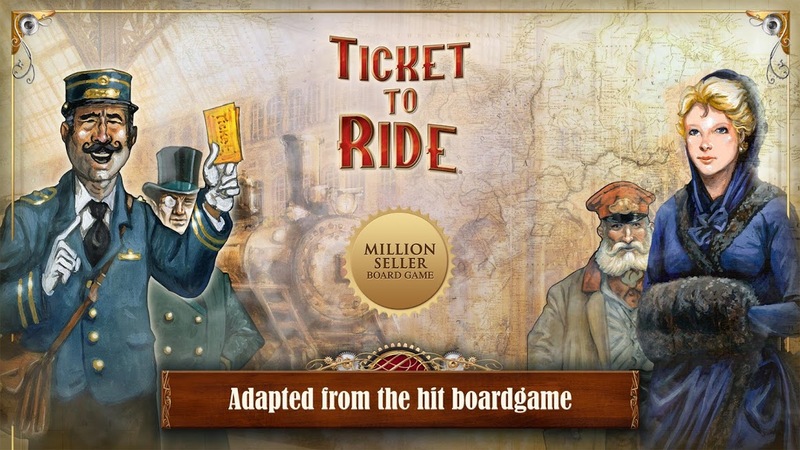 It is a digital adaptation of the famous train game, the Ticket to Ride board game. One of the classic getaway games of today, is based on card drafting and collections and your main goal is to complete as many routes as possible to win the game. Based on the length of the routes, you will be given points. To successfully complete a route, you should have contiguous route between the two cities listed in your ticket. The app is available for both Android and iOS devices. The game costs $4.78 to download from Google Play Store; while the iPhone version costs a bit higher at $5.61. Ticket to Ride railway adventure is a great looking app with its design matching the theme of the game really well. The game is easy to play with and the little crosshair that hovers around helps you to get a better control and also gives you the extra zoom. You can set the timeout per player in the multiplayer mode. It is possible to make it asynchronous game with a huge timeout or have a real time game with short timeouts. In multiplayer mode, you will get to choose the number of players and the map you want to play with. The original map is based on USA and there are additional 9 maps are available as a choice. You can also purchase 2 other European maps. The system is quite robust that you can have over 50 players onboard and join in about 15 games. The community is quite strong with thousands of players available at any given time. Challenge players across different platforms and operating system and play with any players around the world. Ticket to Ride is great adaptation if an excellent board game. Those who live strategies will for sure like this game. You will find it quite impressive from start to finish.It is agaming experience very unique in its genre. The app has almost seven different variations available to be purchased. The Android version runs on devices running Android 4.0.3 and up; it has additional in-app purchases ranging from $1 to $5. The app is compatible with iPhone, iPad and iPod touch and requires iOS 8.0 or later.